After he stopped working with Daddy Long legs, the maple blues award winning garage blues band, Mike Elliot started a new band: Called Elliot and the Audio Kings. The band is again one step closer to the vintage blues sound and tackle everything from fifties rock and roll to jump blues or shuffles. Their music feels at home in roadhouses and small local pubs as well as in a sophisticated private club. With a traditional take on the blues, the band delivers eleven self-penned tracks that are ready to overthrow your daily routine. Each of the tunes is well crafted and it’s a showcase of craftsmanship that is spread al over their debut album. 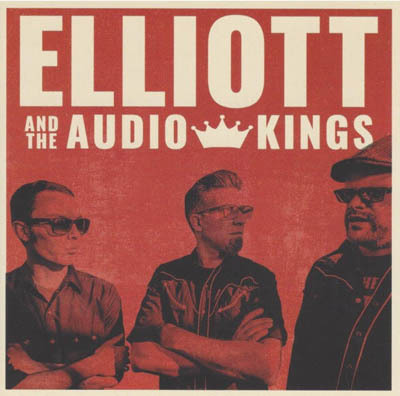 Elliot and Audio Kings are not really your typical blues outfit but instead they bring you a mixture of styles and genres in which blues music is the dominant factor. Leading track “What they Say about you”, kicks in with a sound that mixes old fashioned electric blues with a Rockabilly attitude. On “What Tomorrow Brings” your thoughts immediately goes out to Sixteen Tons, the 1955 tune by Tennessee Ernie Ford. Not that this one is a copy but it got the same rhythm and feel as Sixteen Tons. On “Come on home” we come to one of the first highlights of the album. A gentle blues stroller that I already put out on one of the Clarksville radio sessions. “Another Day, Another Dollar” is without doubt the second highlight of this album. A good old-fashioned very danceable blues tune with again some rockabilly influences. On “Jealous Kind” we do get the obligatory blues ballad and closing tune, “I Know” brings us to the final and last hot pick from this album. The self-titled album by Elliot And The Audio Kings is a wonderful combination of styles and genres and by all means a splendid CD! I just love it.